Hot of the Press! 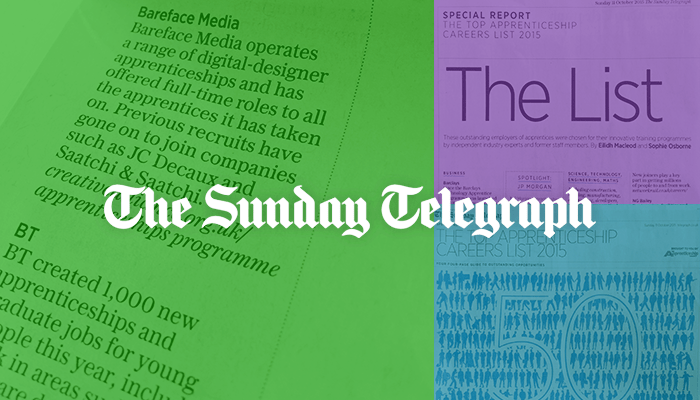 We made The List of the ‪‎Top 100‬ ‪apprenticeship‬ ‪careers‬ providers in The Sunday Telegraph. We were included in the Apprenticeship Careers List as one of the top 50 apprenticeship employers, published in the Sunday Telegraph on 11th October as part of the Apprenticeship Careers Show. We were listed as one of the top 10 (not ranked) within the 'Media, Tech & Communication' sector. The list has been compiled by independent judges include Angela Eagle MP and Sharon Warpole - CEO of Not Going to Uni. This is a fantastic recognition of the hard work out in by the team and all those who have completed apprenticeships with us and gone onto to either work full-time and Bareface Media or other organisations.